Let’s Fan Fold That Loop Loc Cover Please! The proper way to fold and store and in ground or an above ground swimming pool cover is to do what the call a “fan fold”. Basically a fan fold is when you fold the pool cover on top of itself over and over so that stacks nice and neat. 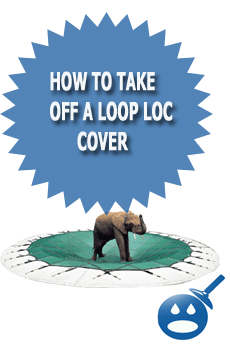 We will show you below how to properly fan fold your loop loc pool cover. You can see here that you will need two people top properly fold the loop loc swimming pool cover or any in ground cover for that matter. You will each want to find a corner or end of the pool cover. Keep on “walking out the cover” as us pool guys like to call it, until you find the corner or the end of the pool cover as we mentioned above. Don’t worry you will find the end but it might take a few minutes. Once you each find and end you will want to pull the pool cover towards each of you as you can see in the picture below. This will keep the loop loc cover tight and help the excess water drain off and through the cover. After you have pulled the cover towards towards yourself like in the photo above you can now at the same time start to pull the pool cover back as show in the picture below. Make sure to keep the pool cover “taught” as you do this. Once the cover is pulled back you can lay that section down on top of the section of the pool cover that is already laying on the deck or the patio. You will want to make each fold around 3 to 4 feet long and then do the fold as show below. Keep OnÃƒâ€šÃ‚Â repeating this process, keeping the pool cover pulled towards you and at the same time pulling it back fold it over itself. This is what they call a “fan fold” in the swimming pool industry. After you fold the cover a few times you will reach the end of the pool cover. You can see in the picture below how the remaining water will drain from the loop loc pool cover once you reach the end. Take the end of the cover and place it on top of the pool cover that is already fan folded. Once you have reached the end of the pool cover like shown above you can start to gather the end of the cover like show below. The next step after this is to tightly roll up the pool cover as you are about to see. As you can see below you will want to roll the pool cover nice and tight so you will be able to fit it into the loop loc cover mesh bag that was provided at the time of the cover installation. We meet in the middle of the cover and then folded one side on top of the other side. This loop loc cover is now fan folded and rolled up tight and ready to be slipped right into the mesh storage bag. Ah….At last the Loop Loc Cover is all folded and read to go away for storage. Now you will know how pool guys fan fold the loop loc swimming pool cover. I have a 35,000 gallon inground gunite pool and I want to purchase a new filter and pump. We currently have a DE Hayward filter and pump. The skimmer is approx 30′ to the filter and pump. I don’t know if we should switch to sand or cartridge and am not sure what brand to purchase. I like the Sta-Rite and have read some reviews. BTW: I am not a big fan of cartridge filters, I like sand or DE. What do you think of the Pentair quad- uses DE and cartridge?Ãƒâ€šÃ‚Â What about their intelliflo pump? I like them both very much, sorry for the delayed response as well. Somehow I missed this question. I like Pentair Products a lot actually, In fact Pentair pumps and filters have less service issues / calls then hayward. I used to work for this one pool company and we did 10 ÃƒÂ¢Ã¢â€šÂ¬Ã¢â‚¬Å“ 15 service calls a day and very far and few in between did we repair Pentair stuff. At this point I would say that Hayward is the ÃƒÂ¢Ã¢â€šÂ¬Ã…â€œwindows PCÃƒÂ¢Ã¢â€šÂ¬Ã‚Â & Pentair was the ÃƒÂ¢Ã¢â€šÂ¬Ã…â€œmacÃƒÂ¢Ã¢â€šÂ¬Ã‚Â, if that makes any sense. If a budget is not an issue, I would go with all Penatir stuff, but if the budget is an issue then Hayward is the next best. I like the DE filters for pools with mesh covers in Northern parts of the USA. I like sand filters for solid cover pools that are in the south, I have worked on pools in a few states, but I like both DE and sand and Hayward and Pentair and my two favorites. I’m impressed. I wish I could fan fold my pool cover but I ordered it 4 months ago from Oasis Pool Service in Beaumont, CA and I can not get it delivered or get a refund. I have contacted the manufacturer without success. Any suggestions ? I would contact the consumer affairs department in your county and file a compliant. Most towns have a consumer affairs office for this exact reason. Decided to open my pool on my own today, and ran into one problem. My safety cover plastic covers for where my pools wall elevates to accompany the stairs on the deck. I think they call it a Gap-guard? How do you guys usually fold this. I couldn’t get that nice sleeping-bag form. How do you correctly fold a loop loc winter cover??? ?